Forge wagons have been around since 1891 when they were invented in Canada by William J. Conroy. However, the style of forge wagons we know and use today was invented in 1956 and used a steel or cast detachable chain for their operation. Since then forge wagon chains have been retrofitted with 600-series pintle chains, and T-Bat/ T-Rod chains. At USA Roller Chain and sprockets we stock American steel pintle chains, steel detachable chains, as well as the standard T-Bar and T-Rod chains. Our steel pintle chains are manufactured using heat-treated components and feature an open barrel design for smooth operation. It also utilizes quad-staked pins for added durability and sideloads capabilities. Our selection of American standard steel detachable chain is manufactured from a special hot-rolled strip steel that is heat-treated for increased strength and a longer wear life. This type of chain is designed for moderate loads and speeds, it is extremely easy to repair and install. 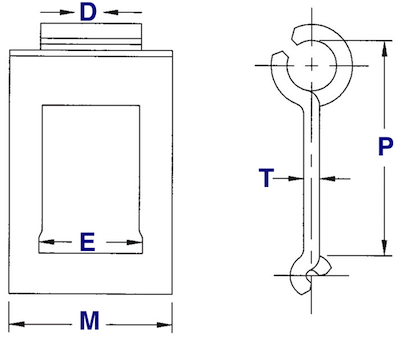 T-Bar and T-Rod chains were manufactured to replace steel detachable series chains. Because of the unique design and high-strength steel material used these chains pose better wear life and durability versus steel and cast detachable series chains. To get a quote on forge wagon apron chain assemblies fill out the request for quote form and someone from our customer service team will contact you.